I had this big post written after reading the last 3 months of comments on the City State of the Invincible Overlord Kickstarter page. I was all piss and vinegar. I was channeling the backers. I'm a backer too. I was angry and it showed. It wasn't pretty. Actually, its embarrassing. Thankfully, some friends that got to peek early told me to step back and sit on it for a few hours, and I did. I reached out to a few folks, including Bob Bledsoe II. I asked questions. I'm still pissed, but my focus is where it needs to be. Solidly on Bob Bledsoe III, the one who ran this horror of a Kickstarter. The one who has a Kickstarter with no funds left to complete. Bob III is the one that is not communicating. Bob III is the one that took $1k from his father to pay someone to layout the project, only to claim to be doing layout himself. Bob III is the one hoping we'll all simply go away. Bob II is still putting money into the project, hoping it completes. Monies made from licensing Judges Guild IP are being put aside to complete this project. In truth, it won't be enough. Bob II isn't totally blameless - he put his trust in Bob III, and Bob III is doing his best to ruin the legacy that is Judges Guild. My suggestion? Follow the lead of +Rob Conley . Release the PDF of the book and the maps to backers. Give the backers "at cost" codes to "Print on Demand" the book and the maps at RPGNow. Salvage what you can. Offer partial refunds as monies are raised by sales of the PDF and maps to non-backers and from 3rd party licensees of Judges Guild IP. Oh, and forget about the Pathfinder version, at least for now. I'm sure the current document is written for the JG Universal System. Take what you can get and move on. There are plenty of KS' out there with reliable and realistic dates. Sometimes you have to take a chance on a newly created KS. With the length of service that Judge's Guild has been around you would think they knew how to make a project with a reasonable and realistic timeline. Sadly Judge's Guild of today is not the same as the Judge's Guild of yesteryear. What is the JG Universal system offhand? Sorry you got nailed by this one, I was wanting to back it but didn't have the cash (kind of like Far West) and am kind of glad at this point. @Nathan, it is a custom stat block that Judges Guild adopted after loosing the D&D license. It not very good. Not that I'm a backer but I think the Universal System would be as useful to your average OSR gamer as Pathfinder. At least the stat blocks would be smaller. Hmm...this post goes live Jan. 23. A Backers Only update gets posted Jan. 24 that 'refutes' the major points of this post. Can someone that backed this post an image of the latest update? I figure Erik will post it, if it's newsworthy. 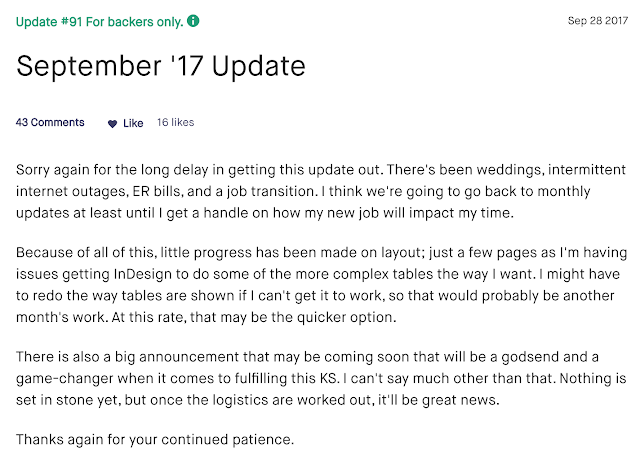 As a backer myself, I was not impressed by the reasons (they weren't excuses) on why the whole thing is late. This whole update was a crapton of excuses, deflections, and typical BS that I've come to expect from JUDGE'S GUILD. I'm no longer blaming Bob3, this is a official, licensed, company supported product. This is a JUDGE's GUILD problem, any family squabbles is irrelevant to me, the company as a whole is responsible. Hello all. This has been a hard update to get to. Not because of the matter of the update, but day-to-day life getting in the way. The new job I took starting in October was very demanding with lots of overtime. The money was good, but the work-life balance wasn't great. They weren't willing to work with me for time off for my new-born daughter or for caring for my wife's grandmother. My wife's grandmother has advanced Non-Hodgkin's Lymphoma and moved in with us just after Christmas. I'm no longer working there as-of January, which means I will have more time to work on this and family matters. This project is still being worked on. I'm still having so many issues with tables and stat-blocks that we are going to present what we have to a couple other companies to see if they're interested in taking over. The last company alluded to in September's update was unable to take this project on. Was this an official Judges Guild Kickstarter? Yes. Is this still being worked on? Yes. Is this project out of money? No. The project is over-budget, but not out of money. Where did the money go? A statement regarding what money was spent and what is left was made back on February 13, 2015. 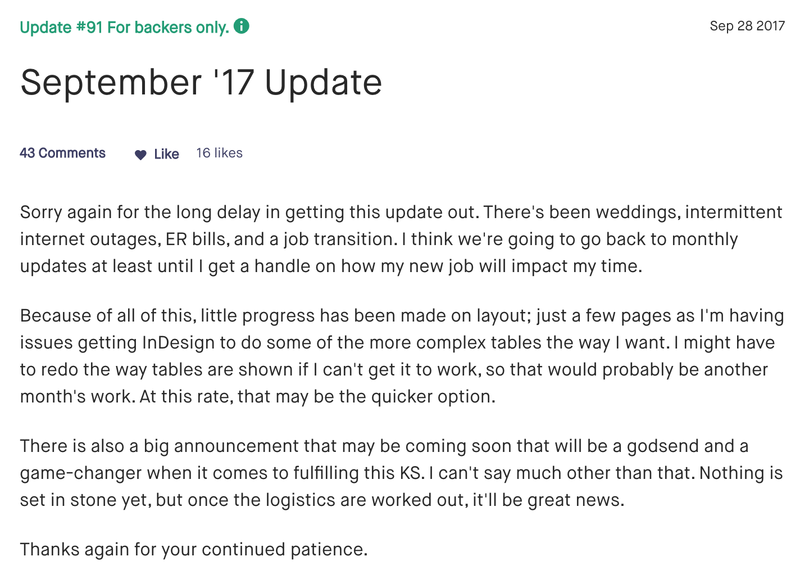 This is why work for the rest of the maps were suspended; it would mean not having the funds to complete the book. 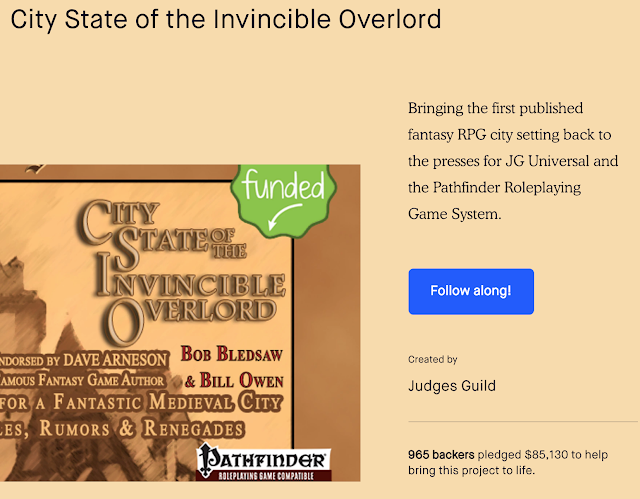 Maybe Bob II can come up with a realistic price for all his Judges Guild stuff (and any scrap of paper he might find in the future) to turn it over to someone who wants to keep developing it? I'm surprised Goodman didn't already buy him out - the only JG products that actually make it anywhere - especially stores - seem to come from GG anyway. I even found a copy of the Tegel Manor reissue in a gaming store in Germany. Bob III cannot get a PDF released but Joseph Goodman can put a physical JG product into stores in other countries. A pipe dream, sure, but I'd never back a JG product published by JG itself again, that's for sure.